The aches and fevers, the sniffles and sore throats – we all know the pains that come with getting the flu. And, unfortunately, that time of year is back when the seasonal flu begins to put on its boxing gloves and make its way into our offices and schools. Fortunately, Publix has your guide to make sure you’re geared up and ready for the fight this year. According to Flu.gov, the seasonal flu is a contagious respiratory illness caused by flu viruses. The season usually starts in the fall and peaks in January and February. Although it may seem early to be thinking about the flu, the heavyweight champion can enter the ring as soon as October. If you react too late and it sneaks in a first punch, you can be down for the count for up to two weeks. When it comes to fighting the flu, your best line of defense is to get vaccinated. 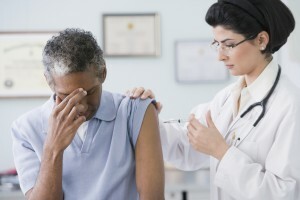 The Center for Disease Control (CDC) recommends everyone get vaccinated as soon as the new shot is available, which is usually early fall. Reach out to your Publix Pharmacy and speak with a pharmacist for more information on how and when to get yours. Our pharmacists are clinically trained and certified to administer flu shots, so you can depend on us to have your back in this year’s fight. In addition to getting vaccinated, be sure to always wash your hands thoroughly. Also, be aware of your duty to protect the other people in your corner of the ring by covering your mouth and nose with a tissue when you sneeze or cough. If the flu somehow manages to sneak in a sucker punch and land you on your back, it’s important to know the symptoms so you can identify the hit early and know how to react. Some flu symptoms include a high fever or feeling feverish, body aches and pains, a runny or stuffy nose, nausea, chills, and fatigue. You may also experience a sore throat and headaches. If you have any of these symptoms, be sure to see your doctor as soon as possible. Then, it’s important to stay home and follow the recommendations of your doctor to get back in fighting shape and prevent your team from being affected by the blow too. Your healthcare provider may prescribe some remedies, such as antiviral medications, but it’s important that you also fight back by getting plenty of rest and drinking lots of clear fluids. You may also want to use comforting support such as humidifiers to breathe easier or gargling salt water to soothe a sore throat. Once you’ve recovered from the hit, be sure to put your gloves up quickly. Vaccinate if you haven’t already and keep taking preventative measures to escape another strike. Also be sure to keep an eye out for friends and family. If they are exhibiting flu-like symptoms, be sure to encourage them to stay home and rest to fight off the opponent and keep others from being infected. Be sure to vaccinate early and gear up so you’re ready to take the flu down and stand champion in the ring of health. Have more questions about the flu? Shout them out in the comments and we’ll do our best to help. You can also check out www.publix.com/flu for more information.